Hen Harbor was originally conceived as a place for "spent" hens discarded by the egg industry to retire and receive lifelong care. While the majority of Hen Harbor's residents are older hens rescued from industrial agriculture, we also provide refuge to "spent" backyard hens -- chickens who have stopped laying (usually around 2-3 years old) and are no longer wanted by their previous caretakers. Most laying hens are killed when their egg production drops, both by the egg industry and backyard chicken-keepers. Those who are allowed to live usually die from neglect (untreated reproductive issues), because few people are willing to spend money on their veterinary care. Birds bred for slaughter by the poultry industry are killed at around 6 weeks old. They are still peeping like the babies they are when they are shackled at the slaughterhouse. Occassionally a brave bird will propel himself out of the hands of his killers and out the slaughterhouse door. Other birds simply fall off the transport truck before they can be killed. Most slaughterhouse refugees arrive in horrible condition, despite being barely more than a month old. They are filthy from lying in ammonia-laden barn floors and most have broken wings from being thrown by workers. All will suffer mobility impairment over time, as their bodies quickly grow too large for their legs to carry or their hearts to pump blood to. Unwanted roosters are an unfortunate artifact of the backyard chicken trend. People who purchase chicks from hatcheries expecting them to grow into egg-laying hens do not realize that a full 10 percent will mature into roosters. Because few towns permit roosters, most of these birds are usually either killed outright or abandoned in forests, parks, or the side of the road. Like any domesticated animal, these roosters rarely last more than a few nights before being torn to shreds by a predator. Animal shelters all over California are full of gamefowl (cockfighting birds), owing to the vigorous illegal cockfighting industry in the state. These birds or their offspring are often found roaming neighborhoods and are picked up by animal control. Usually gamefowl from actual cockfighting operations are are deemed unadoptable and are euthanized. Although most of Hen Harbor's gamefowl are hens, we provide a home to several gamecocks who have successfully integrated themselves. 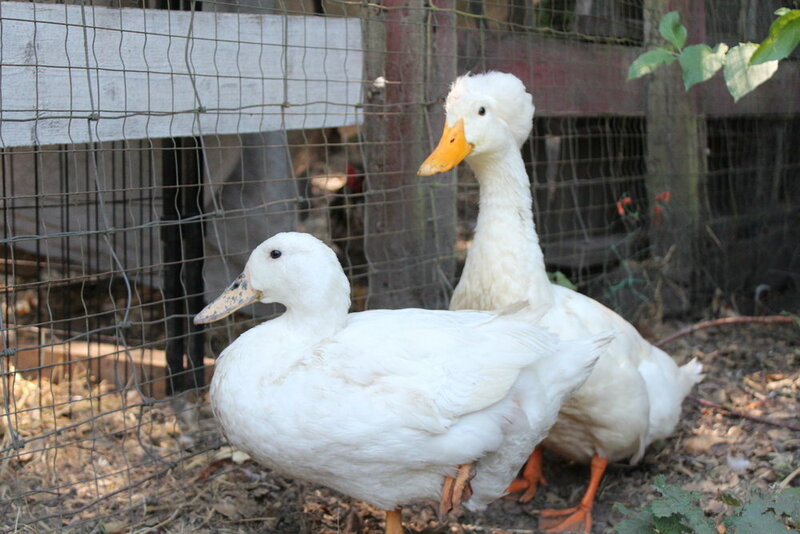 Virtually all of Hen Harbor's ducks and geese are victims of the "Easter pet" phenomenon -- where people buy cute ducklings, chicks or goslings in the spring (usually for Easter) and dump them at local ponds or parks in the fall. Thanks to a grant from the Pollination Project, Hen Harbor recently completed construction of a duck pond and filtration system for our duck and geese friends.